NAB Education Foundation Announces Service to America Award Winners | Broadcast Public Service: Local Stations. Big Impact. The National Association of Broadcasters Education Foundation (NABEF) announced the winners for the 2015 Celebration of Service to America Awards, recognizing outstanding community service by local broadcasters. Winners will be honored at the Celebration of Service to America dinner held Tuesday, June 16 at the National Building Museum in Washington, D.C. Through a combination of programming, fundraising and hands-on support, KING-TV met the challenges of 2014 head-on. In addition to supporting more than 100 non-profit organizations, raising more than $1 million for the American Red Cross and attending 170 community events, they also forged new paths with their coverage and response to local disasters. When the Oso Landslide occurred, KING helped fundraise for relief, got the word out about specific needs and mobilized local businesses to help. When wildfires hit, KING responded, raising money and awareness. After a student shooting at a local high school, KING aired a one-hour prime time special, pausing only for local PSAs. Finally, for their annual Home Team Harvest, KING raised 4.6 million meals. Personally invested and fierce in their involvement, KING exemplifies unwavering commitment to community service. Since 1987, the KEX Kids Fund has provided eye glasses and hearing aids to children whose families cannot afford them in 16 counties of Oregon and Southwest Washington. The program is funded primarily by donations from KEX listeners who contribute through a four-day pledge drive that begins each year on Thanksgiving morning. The annual radio-thon raises approximately $100,000, allowing the Kids Fund to meet the needs of approximately 1,000 children each year. Teachers report that students who are served by the KEX Kids Fund, given proper hearing and vision, invariably move from the bottom to the top of their classes. Since the program’s inception, thousands of children have been helped and millions of dollars have been raised. Cleveland area schools have the second worst dropout rate in the country. To address the educational challenges in the community, WVIZ, WCPN and WCLV partnered to create a nonprofit organization with a mission to address this issue. Throughout 2014, the group expanded its early childhood literacy efforts and partnered with other organizations to help older students stay in school. Through televised programming, they brought attention to community resources and raised awareness for the types of dangers youths face during after school hours. The group also hosted a drop-out prevention day, gathering more than one-hundred 8th graders who received advice from and interacted with experts and recent graduates. WVIZ produced content from this event for local television, radio, web and social media, and followed up with the students at their schools. In addition to assisting students, the group also provides resources for parents and educators. Through PSAs, events and fundraisers, WCCO helped the hungry through year-round outreach. With “Let’s Kick Hunger Day,” WCCO engaged listeners, celebrities and charity groups to replenish food shelves across 59 counties. Teaming up with local congregations, civic groups, corporations and listeners, WCCO helped power the month-long Food Share campaign, the largest food drive in the country. In partnership with the National Association of Letter Carriers, WCCO supported the “Stamp Out Hunger Food Drive,” which collected 1.73 million pounds of food. Finally, the 11th Annual Union Gospel Mission radio-thon featured stories of those whose lives had been touched by such efforts and broke a new record, providing help for the homeless, poor and addicted. Capitol Broadcasting Co., Inc., Raleigh, N.C. Capitol Broadcasting Co. (CBC) has been working for almost a year on a domestic violence initiative called eNOugh NC. The effort included a domestic violence task force charged with building local and national awareness of this issue that impacts one in four women. Through a collaboration with local government partners and agencies, CBC-owned WRAL and WRAZ held a televised panel discussion with survivors and thought leaders, created a website for abuse victims, ran more than 2,000 PSAs, posted TV and internet ads, conducted a social media campaign, aired a half hour documentary and held a three hour phone bank, taking 400 calls from across eight states. In addition, within 36 hours of the Ray Rice story breaking, WRAL devoted 2.5 minutes of advertising inventory to CBC produced PSAs during the national premier of Thursday night NFL. These 60- and 90-second PSAs featured the men of CBC, speaking out against domestic violence. WHAM-TV Rochester, N.Y., Sinclair Broadcast Group, Inc. The NABEF President’s Special Award recognizes historic and extraordinary achievement by a broadcaster. iHeartMedia, San Antonio, Texas iHeartMedia Show Your Stripes is a long-term effort to help guide veterans back into civilian life by highlighting their valuable training and experience. Since the program’s launch, iHeartMedia has invested over $150 million in radio, digital and out-of-home resources to highlight the skills brought back by returning service men and women and their value to employers. Show Your Stripes is the largest public service campaign in the company’s history. The campaign spans iHeartMedia’s 858 owned radio stations across 150 markets, with each station addressing unemployment needs that are specific to each individual community. In addition to nationally produced spots, local radio stations produce PSAs that reflect their community. In July 2014, the company launched a 30-minute long form public affairs show. Local stations also explored opportunities to promote and participate in regional veteran-focused career fairs. 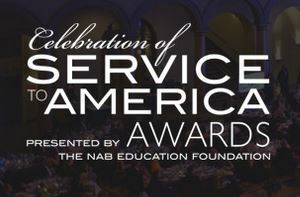 The Celebration of Service to America Awards are sponsored and produced by NABEF with major support from Hubbard Broadcasting, Inc., Bonneville International Corporation, and the National Association of Broadcasters. In recent years, singer, songwriter, musician and producer, Stevie Wonder; multiple award-winning actress Glenn Close; Oscar-winning actor Jeff Bridges; entertainment industry icon Quincy Jones; legendary rock star Sir Elton John; former President Bill Clinton; First Lady Laura Bush; Her Majesty Queen Noor of Jordan; former New York Mayor Rudy Giuliani; boxing legend Muhammad Ali; former President Jimmy Carter and First Lady Rosalyn Carter; former First Lady Nancy Reagan; among others have been presented with the Celebration of Service to America Leadership Award at the event. Details about the Celebration of Service to America Awards are available here.